I love to start the day with a pot of fresh, hot chai made with green tea and sweetened with vanilla rice milk (even better with vanilla soy milk!). For gifts this holiday I made little packets of my blend of chai spices for friends to make their own brew at home. I thought I'd share the recipe! See a cup of this milky chai recipe on an earlier post with a recipe for an excellent breakfast for each dosha. Combine all ingredients and store in a jar or tin. 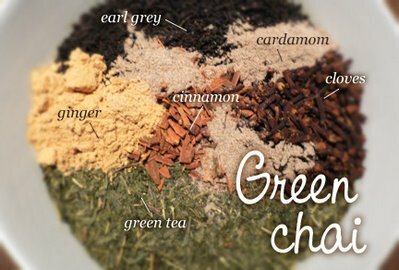 Makes about 1 1/2 cups of dry green chai mix. Place one teaspoon of the chai mix in a metal tea ball or reuseable cloth tea bag. Or spoon one teaspoon per cup of hot water into a teapot. Steep several minutes and serve with milk (dairy or non-dairy) and sweetener. Alternately, boil the mixture in a pot, simmering for 10 minutes or more, with extra slices of fresh ginger for an excellently pungent brew: use 1 cup of liquid (half water/half milk (dairy or non-dairy) is very nice) with 1 tsp chai mix for each cup of tea. Sweeten with honey or sugar if desired. Never heard of green chai thanks for the recipe. Probably a little healthier because of the loose leaf green tea also. I can't wait to try this recipe, thank you. I am curious, however, about Kaphas using soy milk. I thought soy was undesirable for Kaphas? As well, the texts I've been reading re: Ayurveda, recommend cow's milk (skim for Kaphas). What are your thoughts on this? I've been avoiding soy products for Ayurvedic purposes, but also because they are often overly-produced (some high in sugar and additives). I could very well be wrong, though! Anita, thanks for your question and for signing my guestbook! That said, Kaphas need to avoid all other soy products including cold/sweet soymilk, soy beans, cold tofu, soy ice cream, soy mayo, and the like. That helps a lot, thank you! !